If you search for ‘community spirit’ on this remarkable site you will find many links to posts from contributors with fond memories of a solidarity in neighbourhoods in our city that transcended petty political rivalries and which focused on what made living in the area a more enjoyable experience for everybody. 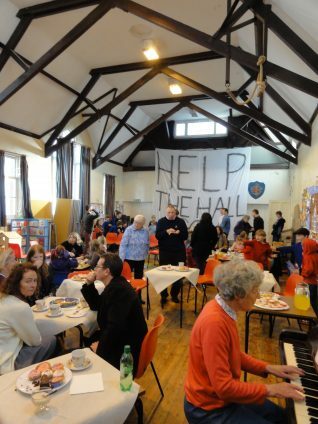 That this still exists is shown by the tremendous response there has been to the initiative to save a valued hall for community use for those who live in Prestonville. In just six weeks £120,000 has been raised towards the purchase of the hall from the church, which wishes to dispose of it. This remarkable effort has been rewarded by the granting of an extension of the deadline for raising the further £80,000 needed to 31 January 2013. The attached photo shows the hall in ‘multi-tasking mode’ but there are also plans to expand the number of uses to which this wonderful building is put throughout the day and evening. What excites me as a former Prestonville resident who used the hall in the 1940s/1950s is that this will enable the youngsters and and current residents of all ages to accumulate their own seeds for happy memories, just as I did all those years ago. If you can help, or you want to find out more, the campaign’s website is here. Good News. The necessary amount was raised by the deadline and Exeter Street Hall has been saved for the community and by the community.